When the sun is shining and the warm breezes are blowing, you don't want to be trapped indoors! Many of us, during this season, are heading into the great outdoors and firing up our grills! Studhubs and I are no different, and when I think about grilling, one of the first things I think about is a nice, thick, juicy burger. However, five months of your basic burger can get a little dull. BUT, it doesn't have to! Like anything else a great burger is only limited to your imagination! You need only go to the fridge or open up the pantry and dozens of variations are at your fingertips! Here is one such burger that was birthed out of using what we had on hand! It is juicy, and full of flavor, and you are going to love it! 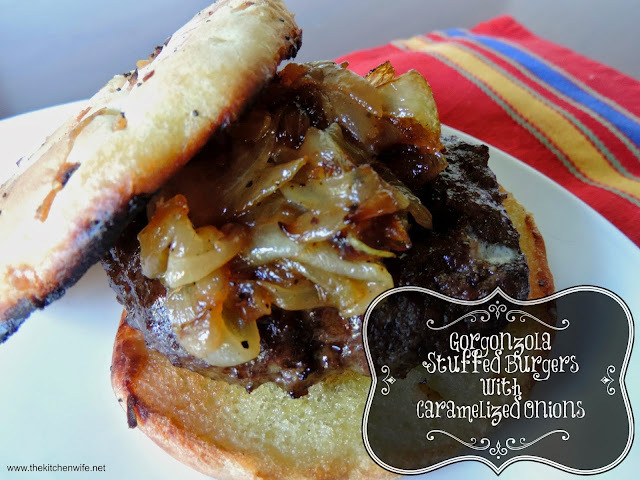 Before you begin prepping your burgers, you will need to caramelize your onions. You will need to melt your butter in a skillet over medium/high heat. Then, add the onions to the pan. If your pan begins to dry out, just add a little water. After 30 minutes, your onions will look like this. Soft, sweet, and full of flavor. I'm pretty excited because Studhubs has agreed to show you how to make HIS burgers. I know that a lot of people say this about their burgers, but his are THE BEST! He just has a gift. If you watch him, it is like watching a master artist work. They are perfectly juicy and moist every time! First, you season your ground beef with 1/2 of the garlic and onion powder, along with salt and pepper. Then he works that into the meat. Seasons it again with the other half. Then works it into a ball. After that, he shapes the ball into a log and then he pulls off a third of the meat. He presses it into a thin patty. You just know this is going to be good. And makes it into a nice patty. They will look like this when they are finished. He seasons them one final time with salt and pepper. Then it is out to the grill. To prep the grill he turns on the burners. but a lesser powered one may require high. He brushes it town, and with an old towel, brushes the grates with oil. Now it is time to grill these beauties. Lay them out, careful not to crowd them. You will want to watch for flare ups or hot spots. You may need to move your patties if they begin to cook to fast. Cook them for 4-6 minutes on one side and then flip. Allow them to cook for another 4-6 minutes. When they are fully cooked, pile them high with the caramelized onions. Oh, and lets not forget the inside! Look at all that great gorgonzola permeating the juicy beef! So this summer, don't get stuck grilling the same ol' burgers over and over. Get a little adventurous! Give these delicious burgers a whirl or try some new flavors. Hey, invite your kids to create in the kitchen and make some memories! Season ground beef with salt, pepper, garlic powder, and onions powder. Press seasoning into the meat. Fold over the meat, and season again. Work meat into a ball, then shape into a log. Take off a 1/3 of the log and press into a thin patty. Fold meat upward, over the cheese. Grill for 4-6 minutes on each side.